What is spinal disc herniation? Spinal disc herniation is most common between thirty and fifty years of age. The reason for this is that the natural process of aging of spinal discs begins in childhood and early youth, so it is not surprising that the disease occurs in a person who is in its twenties. On the other hand, after fifty discs lose a substantial amount of water, and are less likely to "leak". Read on to learn what is spinal disc herniation and how is it treated. .. Symptoms of disc herniation differ when it comes to the lumbar or cervical spine. Annealing of legs or cold sensation in the feet. In the event of contact with the spinal cord there are problems with the whole body. WHAT ARE THE CAUSES OF THE DISEASE? Intervertebral disc consists of a fibrous rings that surround the gelatinous nucleus, which contains a lot of water. Over time this leads to weakening of the ring, small cracks and breakage. When the gelatine content leaks - disc herniation and presses the nerves, which leads to the well-known condition called sciatica. In addition to hereditary factors, on which we cannot influence, a herniated disc may be caused by the excessive workload and insufficient relief of the spine. The nutrition of disc works on the principle of sponges (since they have no blood vessels). In the upright position increases the pressure on them and displace the harmful substances. On the other hand, when lying down or sitting, with a backrest angle of 45 degrees, the pressure decreases and nutrients enter the discs. Modern lifestyle bring a lot of problems (primarily sitting and standing), and little relief, leading to malnutrition and rapid deterioration of the discs. Poor posture, obesity, smoking and lack of physical activity, cause the muscles to become weak, and they, in addition to disks, provide support to the spine. A herniated disc is usually treated with analgesics (medications to reduce pain and inflammation). Then with a relative rest, cooling pads (not heated, as there may be even more nerve inflammation and stronger pain), physical agents (laser, magnetic, electricity). Only after calming the pain apply kinesitherapy and hydrotherapy that is exercise on land and in water. 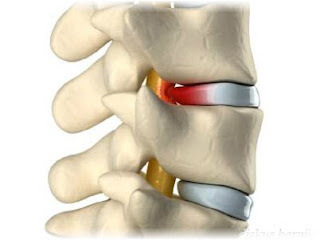 The treatment of disc herniation usually lasts from several weeks to several months. In the case of amplification of problems, disc herniation must be operated on. In addition, there are reasons for urgent surgical treatment - condition called cauda equina (other than pain, there is a pronounced weakness in the legs, numbness in the seating region and the inability to urinate and emptying one's bowels or inability to retain urine), as well as isolated muscle weakness (most often inability to walk on the toes or heels or one foot). After surgical treatment there is a chance that the rest of back will start to drain, and the higher the risk and accelerated deterioration of discs on adjacent levels. It is better to be safe than sorry. However, in most cases, these complications are avoided successfully by keeping the spine and regular exercises. Since this is a very serious health problem which sometimes requires a spine surgery, phytotherapy can only help but never fully heal the patient. Cut into slices mediocre potatoes, and apply on painful areas. You can instead fry on a little oil ten cloves of garlic (which were previously squashed) and add this warm mixture onto painful areas and hold for the next 3 h.
A herniated disc often affects athletes, as well as other people doing sports. People, sometimes with the best intentions to maintain suppleness, get fit and improve their health, unnecessarily burden their own body and expose themselves to numerous injuries. The best recommendation for them is to turn to specialist of sports medicine, who would have access to their sporting activities and make them focus more properly.